Ernesto "Che" Guevara, commonly known as El Che or simply Che, was a Marxist revolutionary, physician, author, intellectual, guerrilla leader, diplomat, and military theorist. 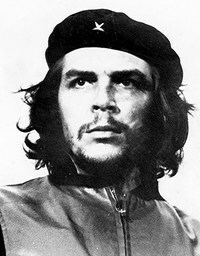 A major figure of the Cuban Revolution, since his death Guevara's stylized visage has become an ubiquitous countercultural symbol and global icon within popular culture. His belief in the necessity of world revolution to advance the interests of the poor prompted his involvement in Guatemala's social reforms under President Jacobo Arbenz, whose eventual CIA-assisted overthrow solidified Guevara's radical ideology. Later, while living in Mexico City, he met Raúl and Fidel Castro, joined their movement, and travelled to Cuba with the intention of overthrowing the U.S.-backed Batista regime. Guevara soon rose to prominence among the insurgents, was promoted to second-in-command, and played a pivotal role in the successful two year guerrilla campaign that topled the Cuban government. After serving in a number of key roles in the new government, Guevara left Cuba in 1965 to foment revolution abroad, first unsuccessfully in Congo-Kinshasa and later in Bolivia, where he was captured by CIA-assisted Bolivian forces and executed. Guevara remains both a revered and reviled historical figure, polarized in the collective imagination in a multitude of biographies, memoirs, essays, documentaries, songs, and films. Time magazine named him one of the 100 most influential people of the 20th century, while an Alberto Korda photograph of him entitled "Guerrillero Heroico," was declared "the most famous photograph in the world" by the Maryland Institute of Art.